This article was written in two parts. The first part was written before I knew whether or not I had won my local store’s Ritual of Judgement, the second was written after I knew what I place I finished and I evaluated the first part of this article and see if my predictions were accurate. Let’s get to it. This last week of the competition was huge: 30 guys went from base coat to fully painted and based in less than a weeks time alongside my Medusa crew and HQ command squad. My display board had been finished before this week with the realistic water from Woodland Scenics, but do to unexpected drainage on four of the pools, I bought a second batch and applied it to finish the display. I also did some pre-planning for if I make it in to the Dallas bracket, specifically by producing a themed army composition list and story. 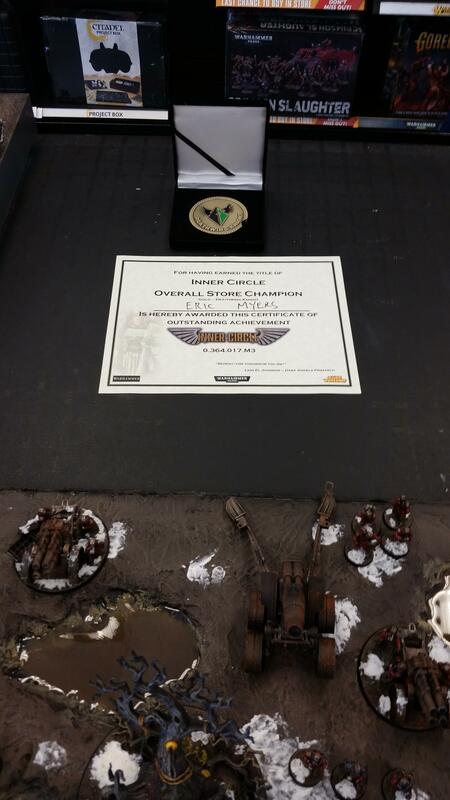 In the Dallas bracket you get points for every named unit, every unit that makes sense within your list and for presenting it thematically (the example they use is a Mechanicum list being presented on a cog). 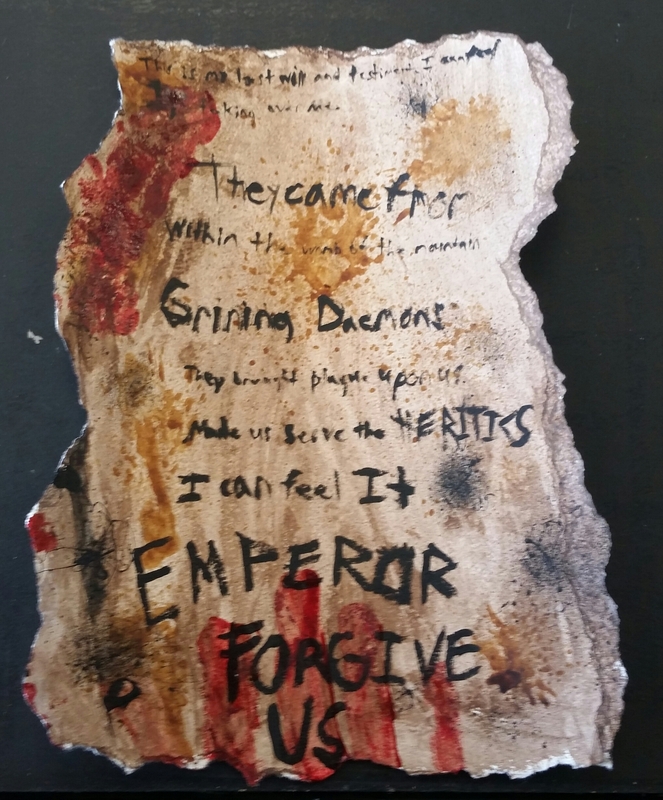 In the spirit of Nurgle, I chose to produce my list and story piece by making worn and messy scraps of scroll. Both were done on watercolor paper, as it has a very scroll like texture to it, and written using my medium layer brush with some Abaddon Black. After words, I spattered Abaddon Black on the page randomly by blowing on the bristles when loaded with the paint. I then shaded it entirely with Agrax Earthshade, followed by doing the same spatter technique, this time using Seraphim Sepia, finishing off with Blood for the Blood God. This is my last will and testament. I can feel IT taking over me. They came from within the womb of the mountain. Grinning Daemons. They brought plague upon us. Made us serve the HERETICS. I can feel It. EMPEROR FORGIVE US. My story element is actually very minimal, this of course being done on purpose. Dallas made it clear they don’t want a novel to read for one’s army story, so I chose just a few sentences to do the job. Also, it carries across that cryptic nature I was going for with this army, leaving my judges to fill in the blanks themselves. 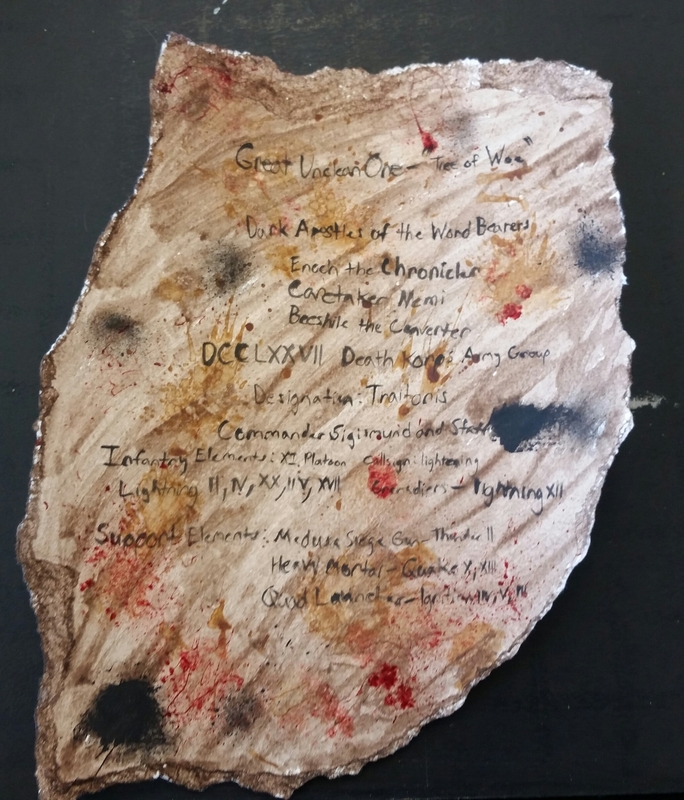 It’s written as though it is the last will and testament of a soon to be corrupted Death Korps Guardsmen. My favorite part of all this is the bottom, which is obviously the eye catcher of the piece. Also yes, I did coat my hand in Blood for the Blood God just to subsequently slam and drag it off the page. I entered the piece earlier today, Friday. May 12, for judging by my store manager. My final unit count came to 17 (just one shy of the 18 unit maximum), with my current grade standing at a solid 438 points. Tomorrow could change that if I manage to get the most community votes, picking up another 25 points. My current prediction is that I will pull an overall win for my store, though this conclusion was reached through mathematics rather than gut feeling. It ultimately boils down to this: the points you get for building and painting your stuff after Feb. 11 plus attending all three Inner Circle event days made all the difference. Being the only person to make all three event days gave me a 40 point boost, which is huge when you get down to the nitty-gritty of the competition criteria. Regardless of tomorrow’s outcome, I couldn’t be more proud of myself. 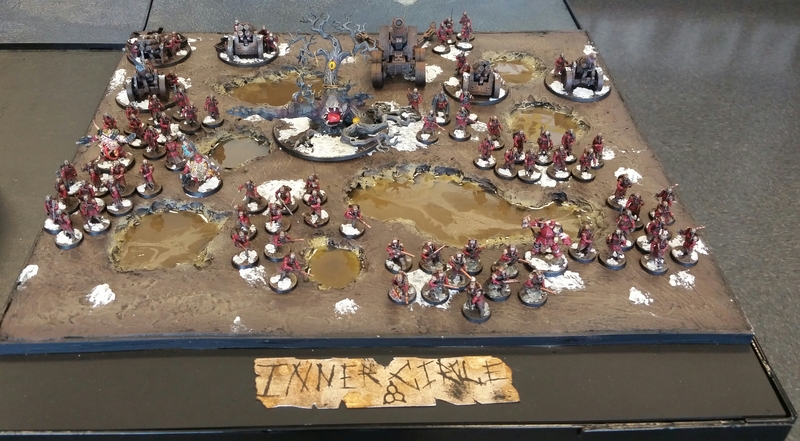 My first fully painted army is done, it looks great, and it took only two months to build, convert, and paint the army alongside the display board. The blogging was the biggest motivator in bringing the project to completion. Accountability is a powerful thing that I intend to use to motivate me on future projects. But for now? Not only was my score bumped up from 438 to 446 due to a mistake in the initial calculations, I also won the community vote, finishing strong with 471 points and taking the gold for my store! There were some tough entries, but the Renegades managed to secure a foothold. From here on, I compete in a regional bracket. This makes my chances to be one of the five finalists all the more tangible. Regardless, I’ve completed my initial goal. With any luck, my series title may become a reality.